Google Play’s gaming services will give Android gamers some welcome new functionality, with persistent cloud-saving, achievements and leaderboards, multiplayer matches and social networking through Google Plus. All Access subscription music streaming service not only makes search and discovery simple, but also offers something for people who don’t want to fiddle around with settings. The service brings a user’s music library together with streaming, with plenty of auto-created playlist and radio station features. Curate your own genres or artists, or let the service do it for you, based the selections you already enjoy. And you can save tracks to your library too. Google announced it will be offering a version of the Samsung Galaxy S4 on Google Play with stock Android. That’s right, if you don’t want TouchWiz, you don’t have to be saddled with it. The combination of leading specs and the most advanced Android software with a guarantee for timely Jelly Bean updates direct from Google will be excellent news for many Android fans. The 16GB device will be available in June. Google has revealed a new dedicated Hangout app, springboarded from Google Plus’ Hangout feature. Group chats feature a spiffy new interface that focuses on interaction instead of grouping communications by contact. The conversations are saved and can be pulled from any compatible device or deleted and shut down. Group video chat has been finetuned for ease, so users can start a video hangout easily by tapping on an icon. Participants are then automatically invited to the vid chat, regardless of device, and all for free. This could be the jewel in the crown of Google’s announcements. To say that the company offers some cool new Android and Chrome photo features would be an understatement. There is a huge set of tools available now, many of which are incredibly simple to use and extremely helpful for amateur point-and-shooters. The company says that using its cloud-based photo editing functions are like using its data centers as your new darkroom. Perhaps more accurately, it’s like having a darkroom equipped with a full-time photography assistant. The service has several tools that can automatically make adjustments to your images. Just upload your photos, and Google can stitch together images for panoramas or create a time-lapse animated GIF with several similar shots. Auto-enhance and Auto-Awesome can automatically enhance colour and contrast, soften skin, save blurry pics and over-/under-exposed photos, and alter various other elements. And if you don’t like the changes, you don’t have to keep them. Curation is another major benefit. Google can select the best pics by recognizing friends and noticing if they’re smiling, or choose based on aesthetic quality, landmark locations and overall image quality. It can even identify duplicates and smartly add only one. And once you have your photos and albums all set, you’ll have a whopping 15GB of cloud storage to house full resolution images. Of course, there were many other announcements, including a new, rather “pinteresting” redo of Google Plus, as well as Maps, Search, Google Now, Google Play for Education, Android Studio and notification sync across all devices. But throughout the presentation, the message was clear — Google is turning its attention to the user experience. It seems to realize that most people don’t want to waste time endlessly tweaking things; they want seamless experiences and ease of use. And the company wants to give that to them across all of its products. Looks like the message was met with enthusiasm all around. 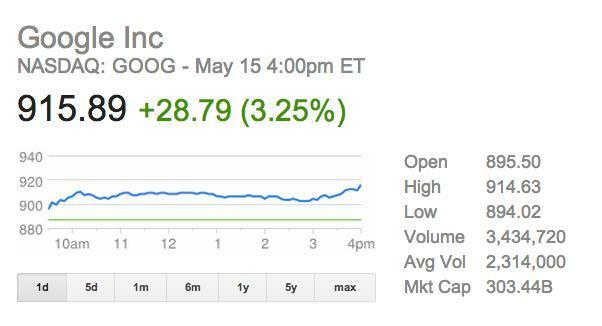 Google’s stock swelled past 900 in advance of the conference and held its ground as the announcements rolled out. 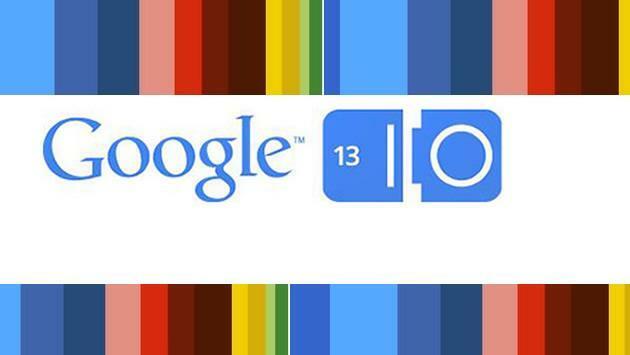 What were your favorite tidbits from Google’s conference today? Weigh in.